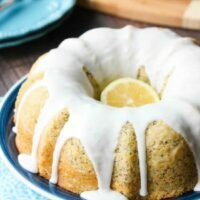 Lemon Poppy Seed Bundt Cake - Dessert Now, Dinner Later! 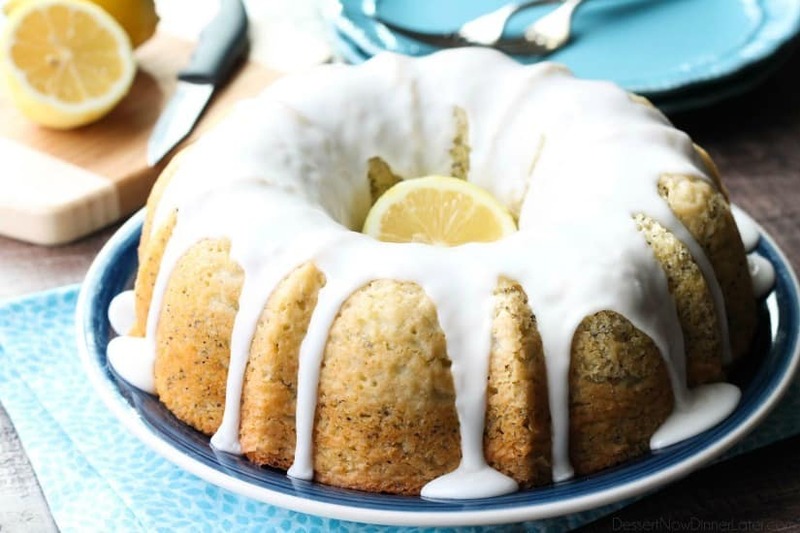 Lemon Poppy Seed Bundt Cake is perfectly moist, full of citrus flavor, and topped with a zesty lemon glaze. Baking always brings me joy, even amidst the snow and cold that winter seems to be hanging on to. And the most cheerful desserts almost always include lemon (or other citrus fruits) because they wake up your taste buds with their tang! 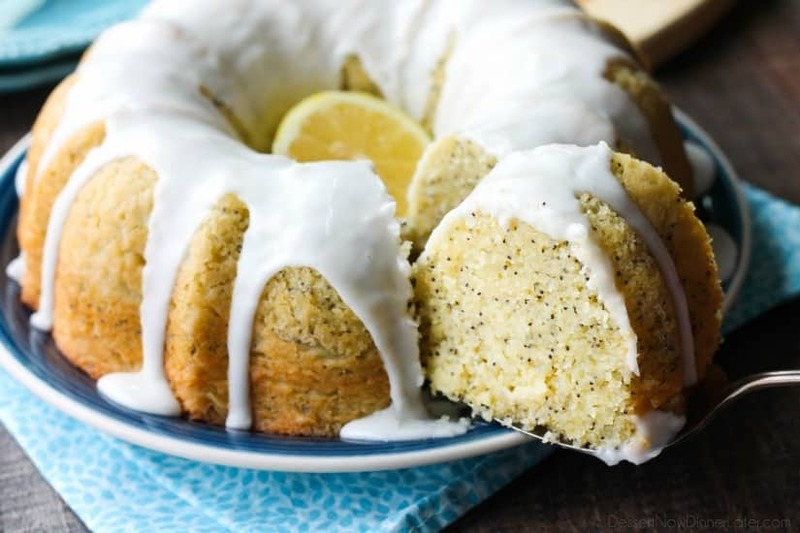 This Lemon Poppy Seed Bundt Cake does just that! 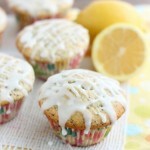 Fluffy, yet moist and fragrant with lemon. 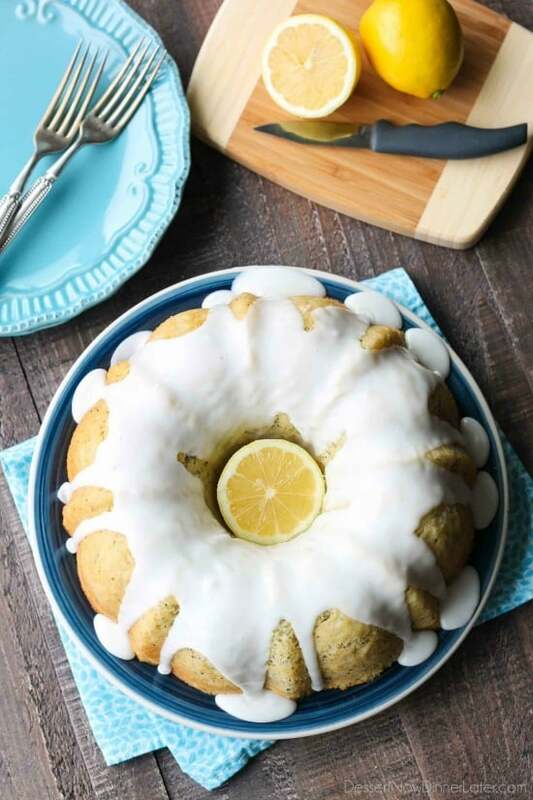 This Lemon Poppy Seed Bundt Cake is perfect for spring or Easter! 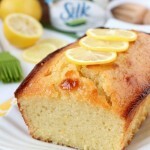 I’ve found a basic pound cake recipe that I really like and altered it for this recipe. It combines butter, coconut oil, and a good amount of eggs for flavor and moistness. 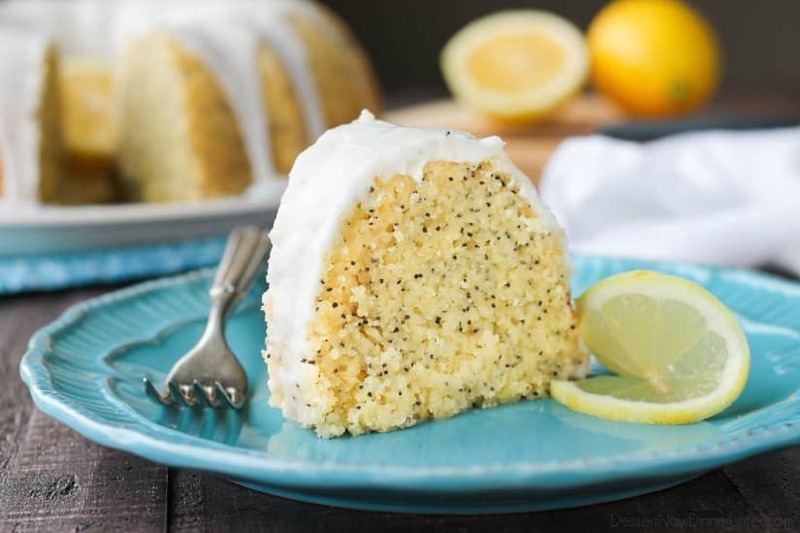 All I had to do was add my citrus components, and some poppy seeds, and you get this Lemon Poppy Seed Bundt Cake. 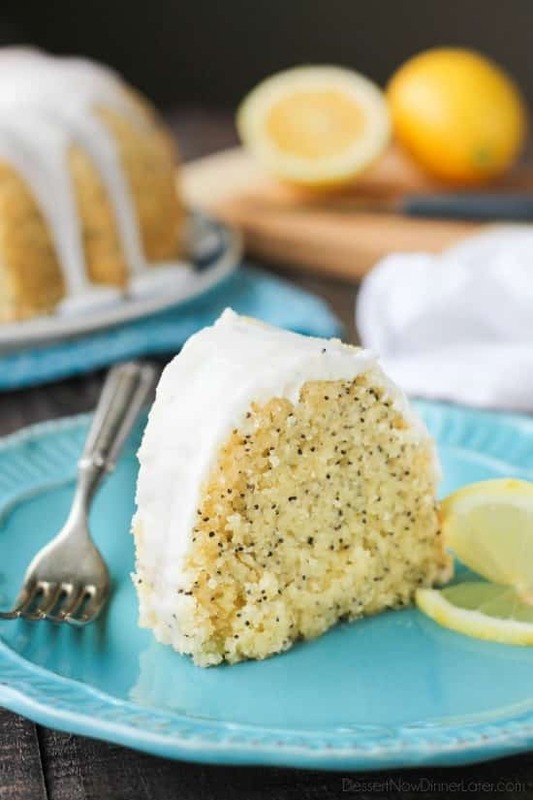 The cake itself has a light lemon flavor and the glaze on top gives it a pop of lemon, which is what I love! I want to be able to taste that tangy lemon in my mouth. The only problem I had with this cake was eating too much of it! Haha! I had to plate it up and send it to neighbors so I wasn’t tempted to eat the whole thing. I also had to hide the lemons for this dessert so my kids wouldn’t eat them first. They are just like their momma when it comes to citrus fruits. They LOVE them! My kids were so glad when they could finally eat this cake. I was torturing them taking “forever” to photograph it first. Haha. Enjoy! 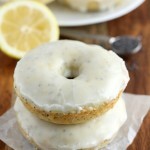 Mix in lemon juice, lemon zest, lemon extract, and poppy seeds until just incorporated. 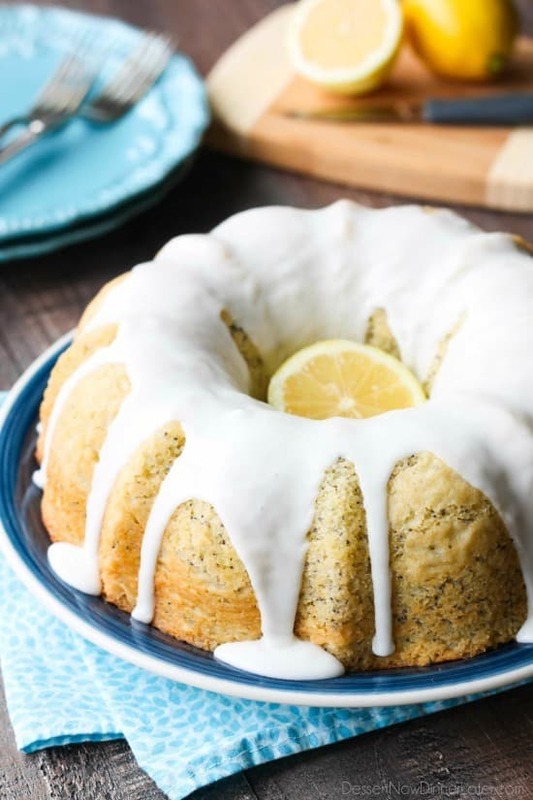 Make the glaze by whisking the ingredients together to desired consistency, adding more lemon juice to thin, or more powdered sugar to thicken. Pour over cooled cake. Slice and serve. Store cake in an air tight container up to 5 days. 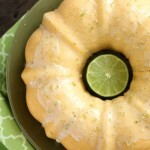 *Altered from my Lime Bundt Cake recipe. I love lemon desserts this time of year! I wish I had a slice now! I bake all the lemon desserts this time of year! Haha. Thanks Jessica!